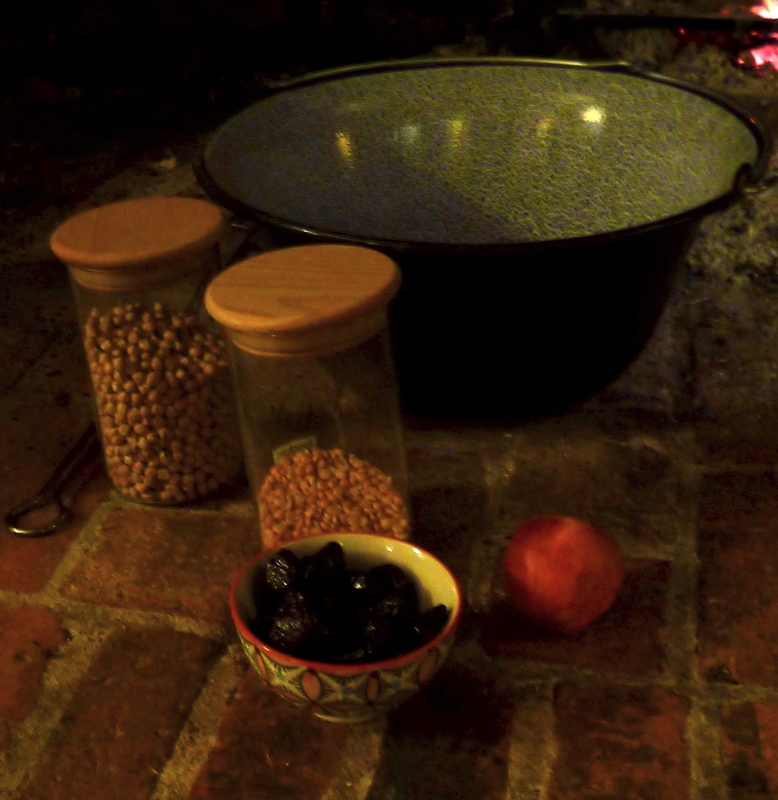 Our fireplace is big, with a wide chimney, and some of the old metal hooks from its pre-modern cookers cooking days are still in place. I rest a metal rod between two of them, loop a thick chain around it, and from that I can hang my pots and grill. (They hang from a tripod when we cook outside.) We’re getting fairly adventurous now, although I have been banned from cooking some kinds of fish in there, after it took several days for the smell of sardines to leave the house. It’s perfect not just for big weekend family cooking, but for cooking the boys’ evening meal too. This is especially true in the winter when by that time it is dark, not to mention bitterly cold outside, so there’s no way we’re going to picnic outside. 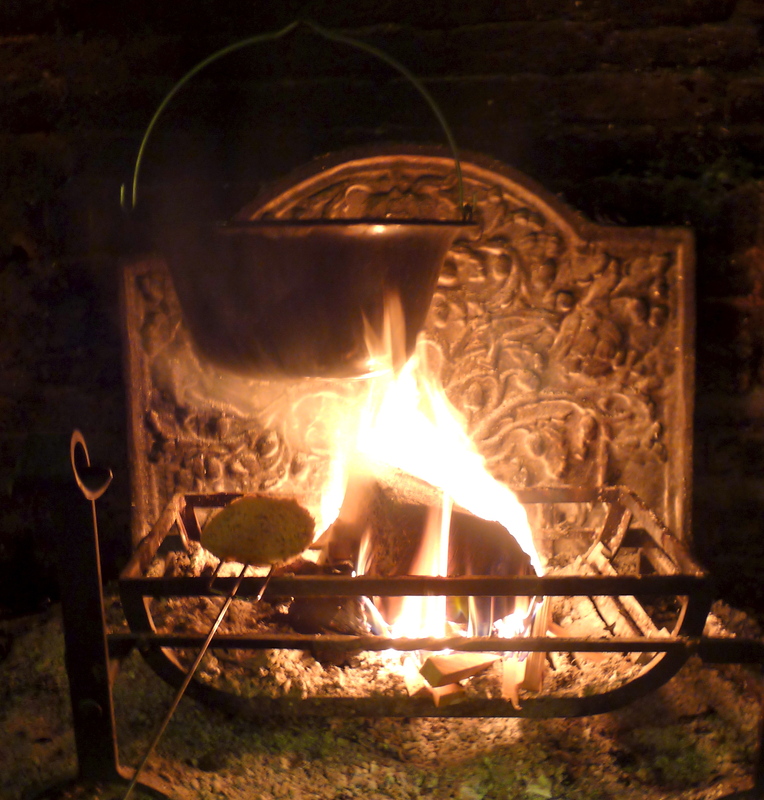 The fire is usually lit anyway, and with a little thought the menu can go very happily fire-wards. If time is short, then grills are the way ahead, mostly meat or vegetables. Kebabs are an obvious and firm favourite, as is anything in the Turkish / Greek / North African vein of grilled meats with wonderful accompaniments. Breads can be heated and toasted, and although we do crumpets, muffins and toast on forks, the pittas and flatbreads are warmed on the hanging grill. Chopped salads get piled into bowls, as do yoghurt and dips (click here). An old blanket goes on the floor to protect the rug from the worst of the tomato / merguez oil / harissa onslaught that it about to hit. With a little time on our hands, soups and stews are very achievable. Again we tend to stay with the Southern / Eastern Mediterranean vibe, with tagine type dishes, cumin spiced soups and robust stews of pulses and warm spices being the recipes of choice. Our favourites are almost inevitably based on the recipes of Claudia Roden, a truly great cookery writer, and others that she has inspired. Her lamb and apricot tagine is a big family favourite (click here). Even on quick-grill evenings, there is usually time to make some applesauce, which will cook down whilst we devour the main course. Ours is a simple recipe, based on one we first tried at a Forest School cook-out a little while ago. It only involves good cooking apples (we get ours from our tree-house tree in the garden, and I’ve no idea what sort they are*), peeled, cored and roughly chopped, a little sugar to taste, vanilla extract, the tiniest amount of ground cloves, and lots of ground cinnamon. We also add a little water to stop it catching before the apples begin to break down. * They behave like traditional British cookers, and make really good juice, with no need for other varieties to balance the flavour. A lady in the village – who doesn’t like gardening or cooking – told me that they are Bramleys, but Bramleys are triploid (they need 2 different pollinators, or a self-fertile pollinating partner) and until we put new trees in recently, there were no such pollinators that we could discover, yet we still had a good crop. So I’m really not sure.